The Cortech Sequoia XC Jacket is built for any adventure just like the Sequoia XC Pants it connects. 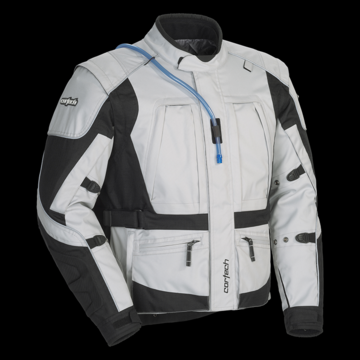 A removable waterproof and breathable Rainguard® barrier combines with a comprehensive ventilation system to make the Sequoia XC a first-rate adventure touring jacket. • Performance cut, 600 denier Carbolex® shell with 1680 denier Ballistic polyester in key areas for abrasion resistance. • Phoslite® reflective material panels and piping for increased nighttime visibility. • Accordion-Style expansion panels for increased flexibility. • Two zippered hand pockets with waterproof lining. • 500 denier Spandex Carbolex® material for a performance fit. • Features 8” pant/jacket zipper attachment with the pant side included. • Trim fit styling with ESO™ zippers.